While they do not taste exactly like the store's, they still taste absolutely divine. 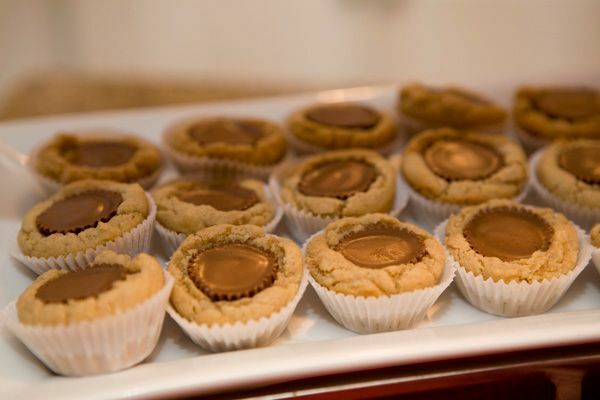 I will totally be making them again. And possibly again. Some interesting observations here about me, my workspace, and the way I operate. 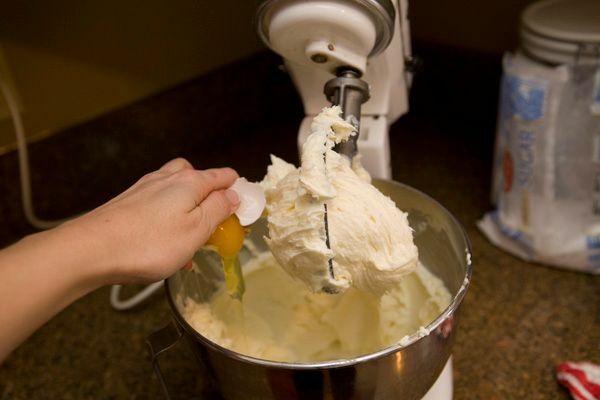 Mix the cake and frosting with your hands until combined, adding more frosting to taste. 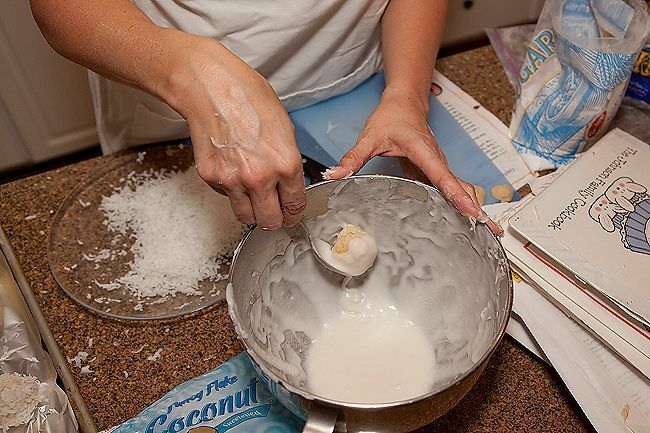 Then pour in some coconut. I added roughly 1 1/2 cups. 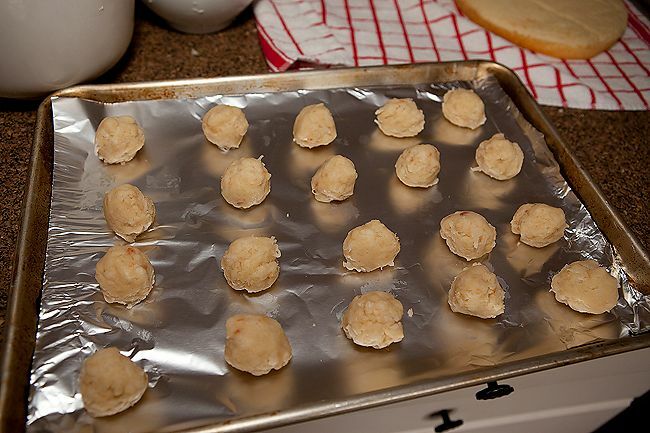 Then roll them into balls and pop in the freezer for about 15 to 20 minutes. 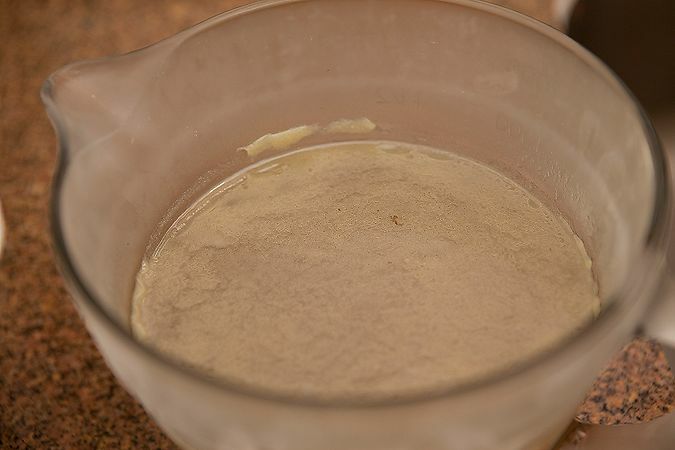 I wanted it pretty thin, so I ended up adding easily 9 Tbsp of water or more. Just keep adding water until it's the consistency of Elmer's glue. I dipped the balls into the glaze and basically rolled them on the edge of the bowl to get most of the glaze off. Otherwise, it's just too much. You only want a light coat. 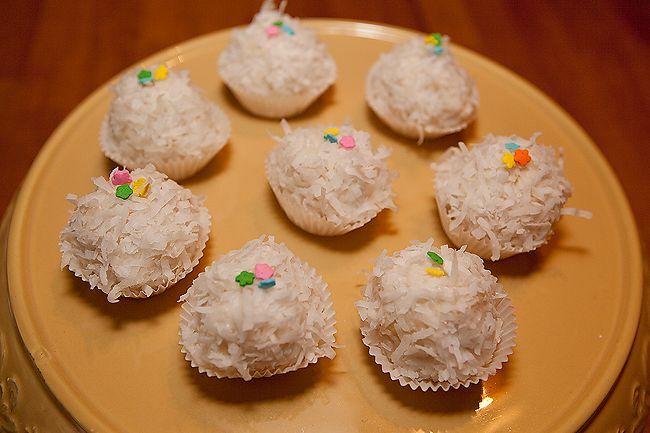 Then dip, roll, and cover these babies in coconut. 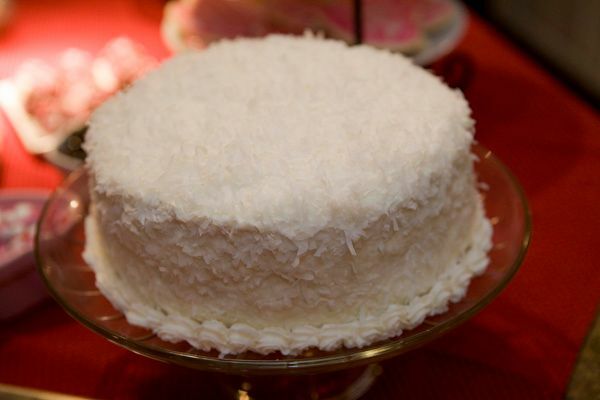 Be prepared for the coconut explosion in your house. 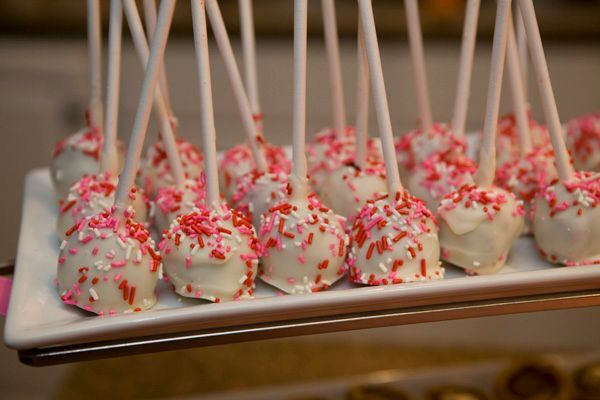 It gets E-V-E-R-Y-W-H-E-R-E.
Garnish as desired and try not to eat too many of them. 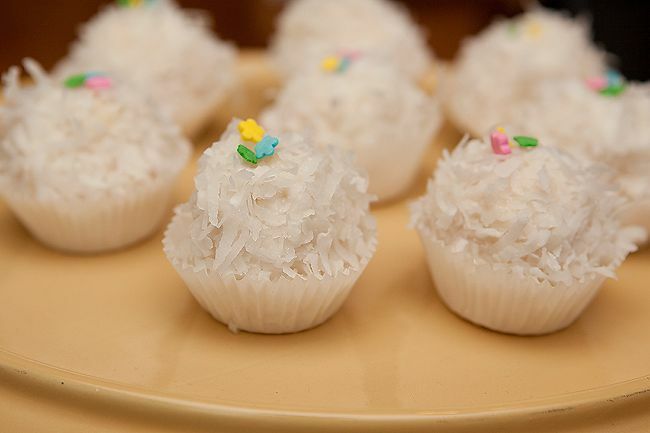 I popped them into mini-cupcake papers (though I was wishing I had a color other than white so as to make them stand out more), but I'm pretty sure no one is going to complain about that. Except the angry voice in my head. And nobody listens to her. And that, my friends, is how you win friends and influence people. Amen. Alternate title: How to make your husband go absolutely weak in the knees. What's that? Your husband's love language isn't homemade chicken noodle soup? Make this, and it will be. I guarantee it. That sofa you've had your eye on? A girlfriend's trip to Paris? Make this soup for him, then casually drop into the conversation what you're wanting, and he will be powerless to resist you. 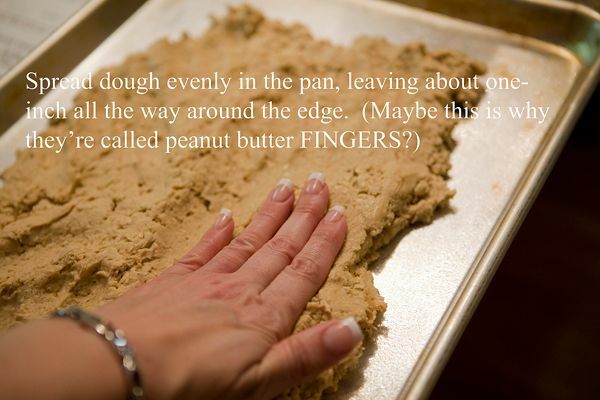 This is an ancient family recipe, going back generations. 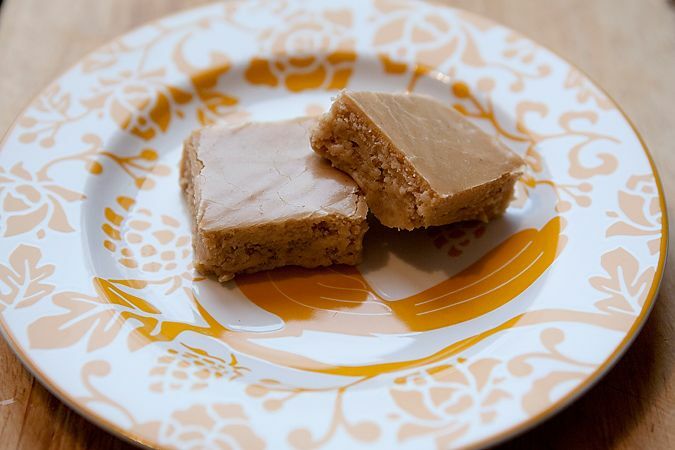 It was a staple in the Husband's childhood home, and has become one in ours. 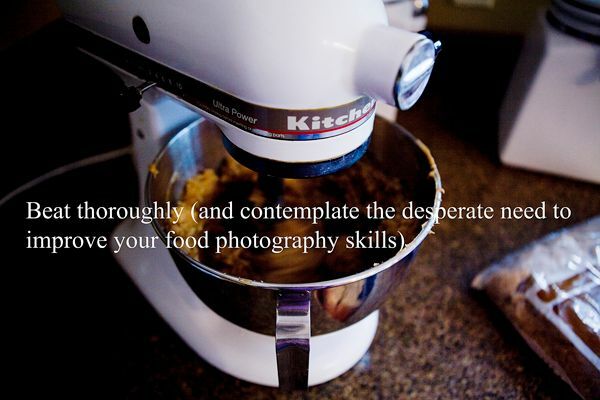 It could not be any easier, and I feel it a sin if you waste your life on soup any less worthy. 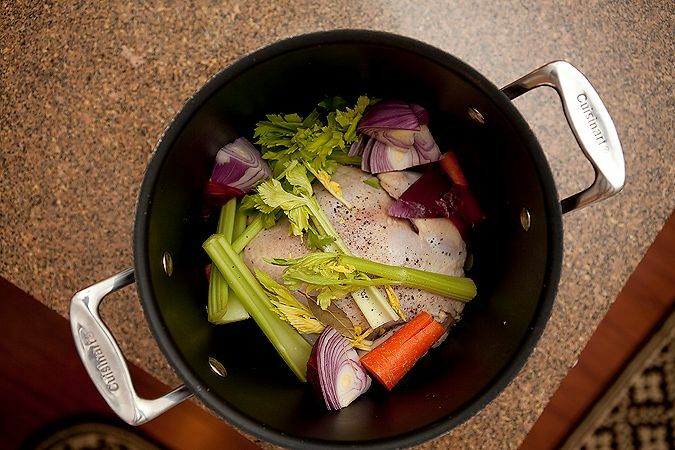 Step one: Take a whole chicken and throw it in a large stock pot. We love to make this with leftover turkey at Thanksgiving the best. Second in line would be the pre-cooked chickens they sell at Sam's Club. But even just a regular, boring, everyday whole chicken will cook up nicely. Add: A few whole carrots (unpeeled), a large onion (quartered, and with the skin left on), a few celery stocks (leaves still attached), a bay leaf, and some salt and pepper. I used a red onion here because it's what I had, but red, yellow, or white - any of them will work. Pour in enough water to cover the chicken by a good inch or two. 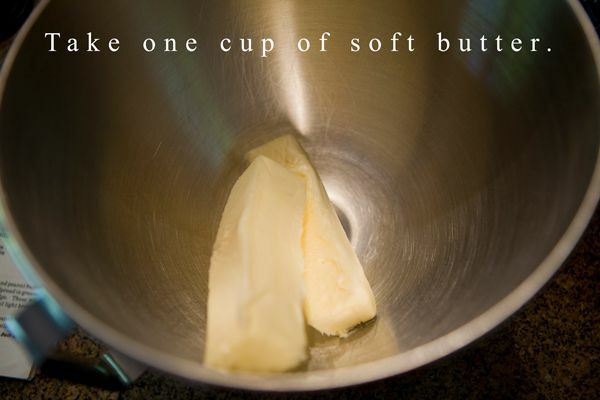 Then plop it on the stove and bring to a boil, lowering the heat and letting it simmer for a few hours at a soft boil. 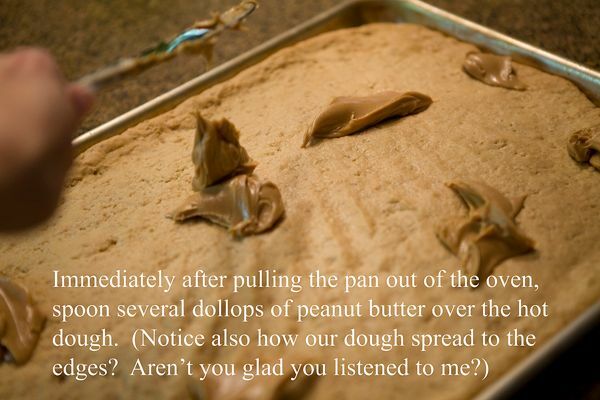 During this part of the process, your house will smell divine. 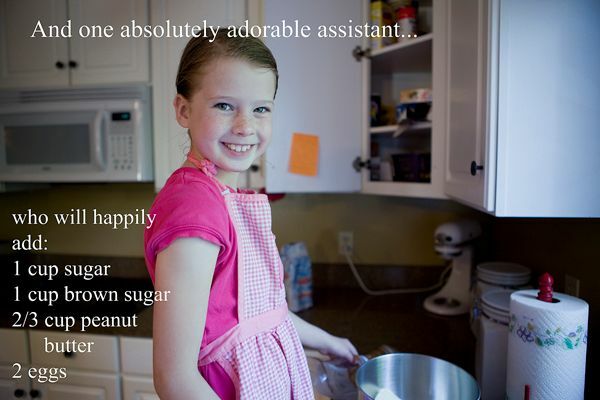 Your children will salivate. 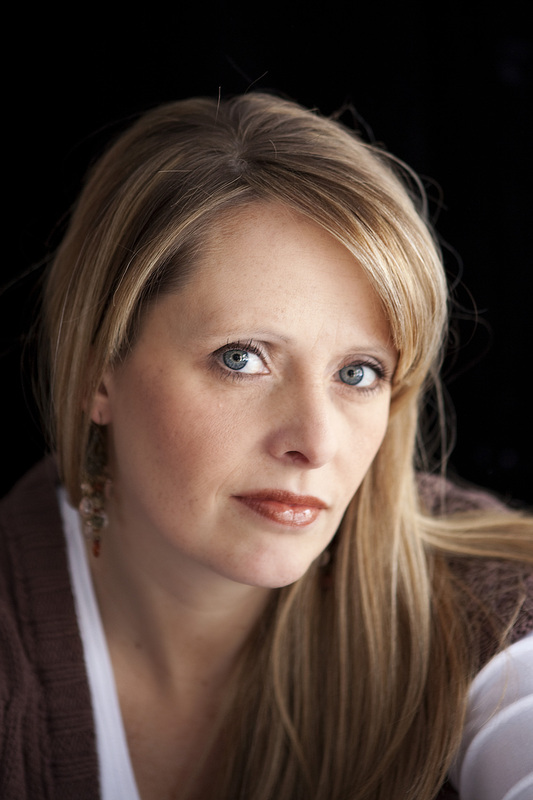 Text messaged photos sent to your husband's phone will result in meetings being canceled and him walking through the door MUCH earlier than normal. 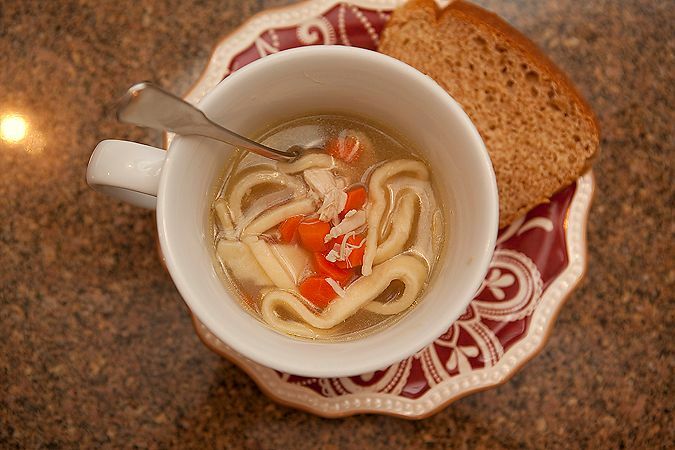 I'm telling you, this soup is like a magnet that pulls your loved ones home. Once it's simmered, boiled, and married all the lovely flavors together, pour everything through a colander to a large bowl. Notice the splash and spillage of broth out the sides? Tragic is what that is. 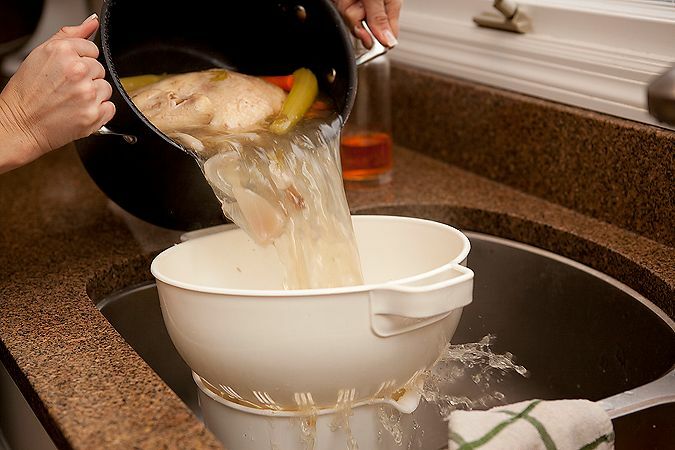 I like to then re-strain my broth through a very fine colander or cheese cloth to remove any remnant chicken bits. Your broth will have a lovely yellow color and smell positively delicious. 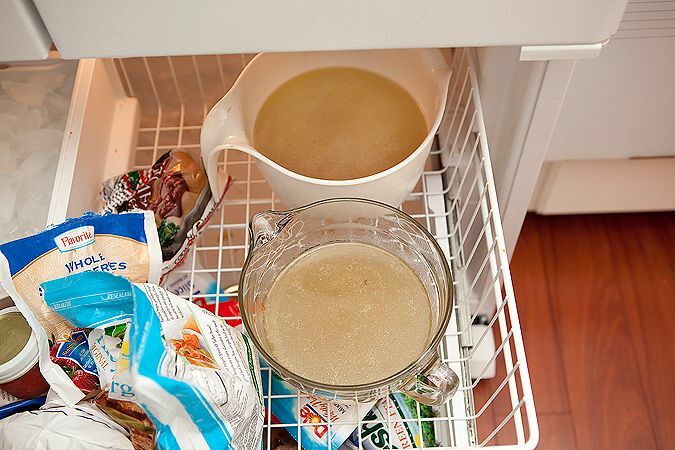 At this point, you could freeze your broth and save it for another day or even another cooking purpose. But since our hearts beat to the drum of chicken noodle soup, that is where we'll be headed. If I can, I make the broth a day ahead and refrigerate it, bringing all that lovely fat to the surface. 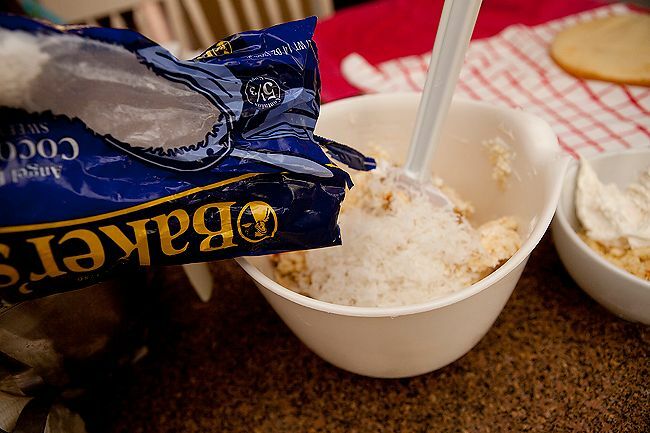 It makes it so easy to scrape it up and out - keeping your inner thighs free for other fatty treats. But with this batch I was in a hurry, and we wanted to eat right away, so I poured the broth into two containers and froze them both. Splitting it like this made it so that the broth could cool/freeze faster, resulting in a lovely layer of fat just waiting to be removed. 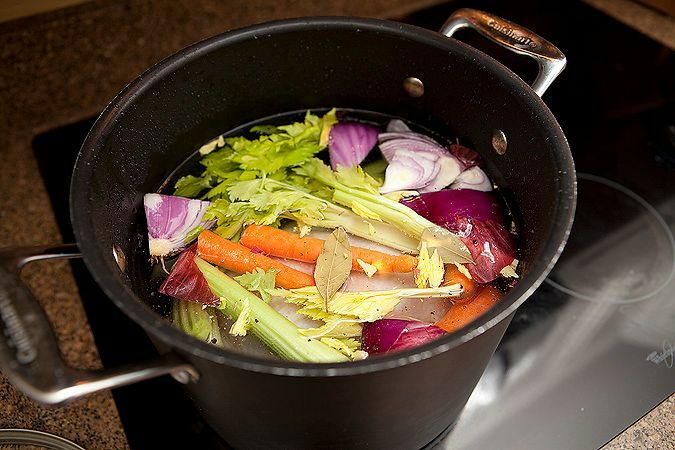 Pour the now-fatless broth back into your stock pot and put it over medium heat on the stove. 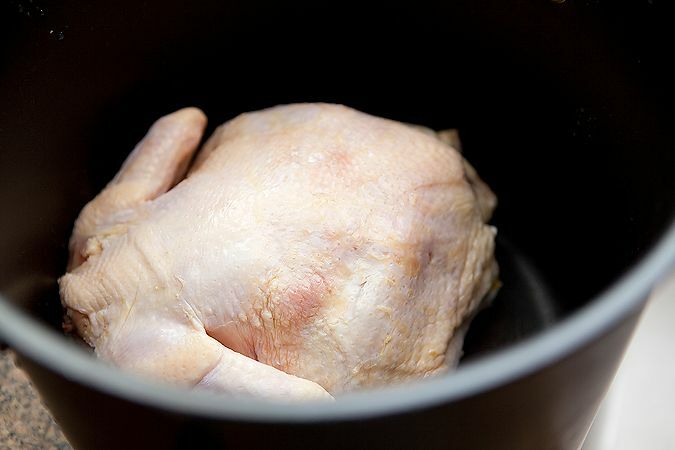 By this time, your chicken should be cooled enough to remove all the meat from the carcass. Probably the worst job in this whole process, but a necessary one. Discard the bones and vegetables once all the meat is removed. 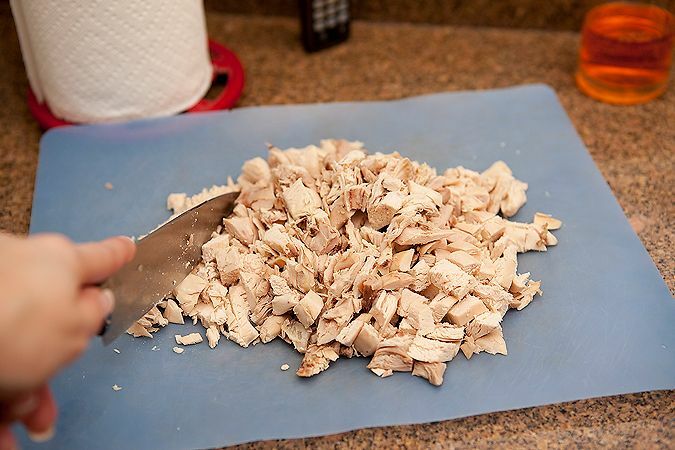 Chop your chicken finely. Add it to your broth on the stove. Recruit a minion or two with the promise of knife usage and you will find help abundant in the kitchen. Have the minion peel and chop 5-6 carrots. Or ten if you like. Whatever suits your fancy. Then add them to the pot. Next comes the step that MUST NOT be skipped. 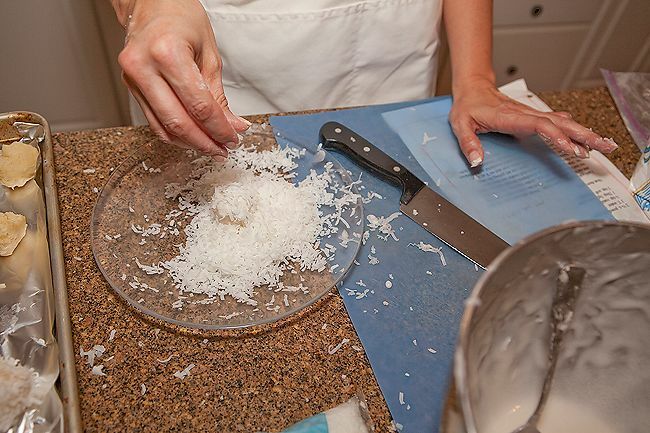 Don't be tempted to throw a few handfuls of rice or (heaven help you) store-bought noodles. The whole point of this soup is the homemade noodles. 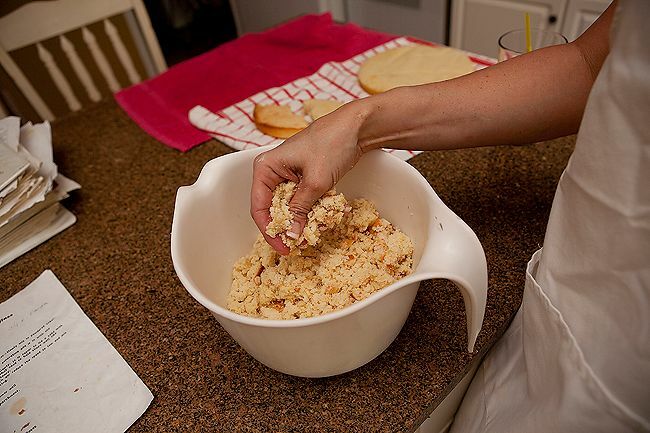 Mix all ingredients together, adding more flour or milk to make a pliable dough. Also? We typically double or triple this for a big batch of soup. What can I say? Girlfriend likes herself some noodles. So do her peeps. 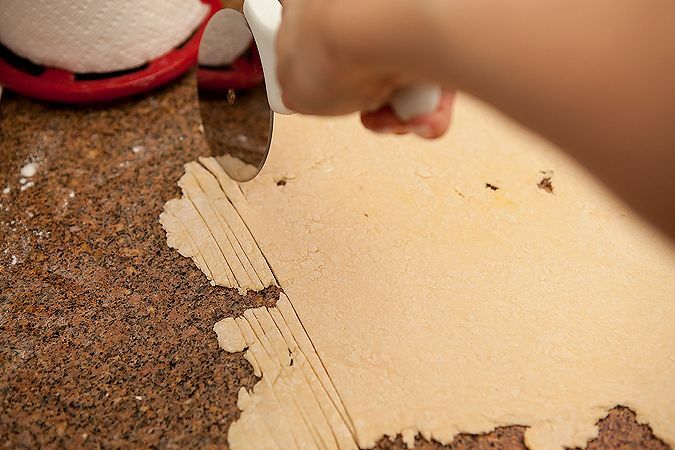 With a rolling pin, roll the dough flat and slice it into strips with a knife or pizza cutter. Don't be worried about getting them all even and perfect. Homemade noodles should be of every height, width, size, and breadth. 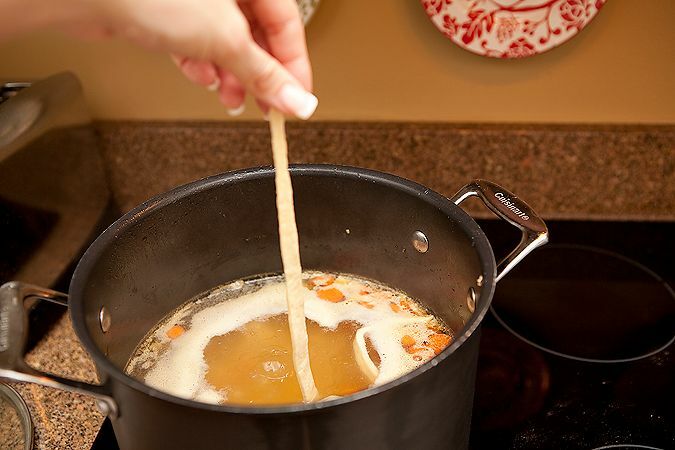 When your broth is at a medium boil, drop your noodles in, one at a time. Simmer for 15-20 minutes. Then, ladle up a big bowl. If you are really awesome, serve some warm bread and butter on the side. Then sit back and watch your husband's face carefully. 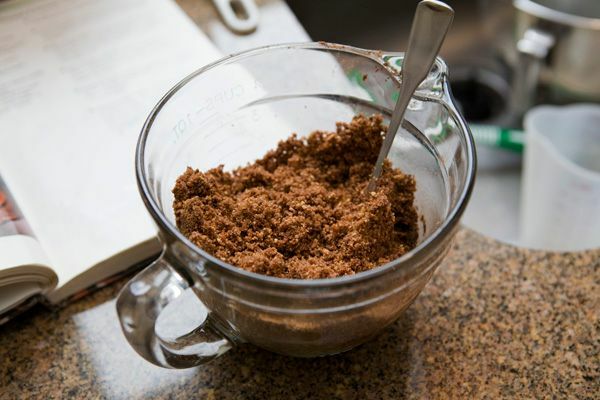 With the first bite, and its earthy, homemade goodness, you will see precisely just how much he loves you. He will be unable to hide it. You will be delighted. Now it's your turn. What can you teach us today? Leave the link to your own how-to post in our Mr. Linky below. Then be sure to copy the html code (under the blue button on my sidebar) into your post. Sit back, and wait for the internet to bow at the throne that is your genius. This is my Grandpa Johnson. Isn't he handsome? He was a big man, about six-foot-two or six-foot-three, with broad shoulders and (when I knew him) a head full of thick, silver hair. He liked to swear and drink coffee (though both were against his religion). He cut off two fingers in a shop accident and liked to do irreverent things with the nubs. 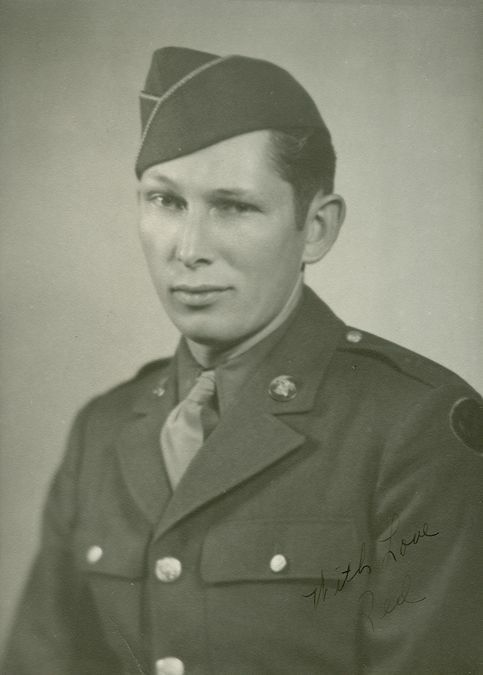 He had a passion for his country, having served it honorably during World War II. He loved to travel and had an unusually large collection of bowling balls in the basement. He made jewelery, and always wore turquoise rings on his fingers. He was gruff and loving, all at once. He was the type that was embarrassed at affection, but would be thoughtful and generous to others. He liked order and discipline. It used to drive him crazy that I never finished a meal. Oh, if only he could see me now. Grandpa, don't worry - I finish PLENTY of meals. He had the best garden. I fell in love with crisp, green vegetables sitting around his table, the multi-colored terrycloth linens underneath the pink desert rose plates. He loved his grandchildren and was tragically taken from them far too soon. 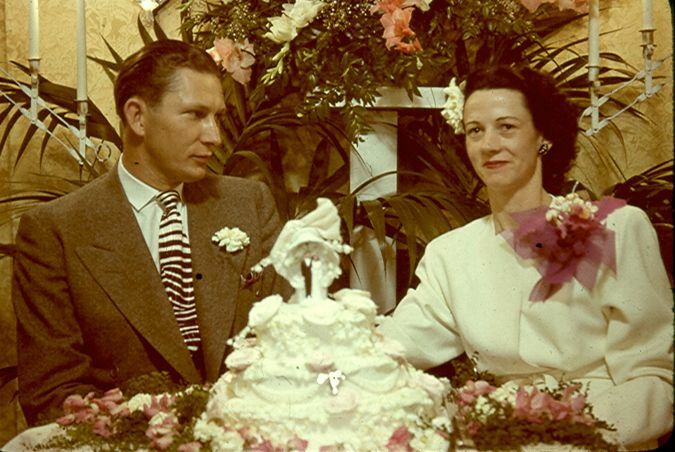 Here is a picture of Grandpa and Grandma at their wedding. Doesn't it look like he just can't get enough of her? I love that picture. I think every woman ought to be worshiped and adored by her husband. 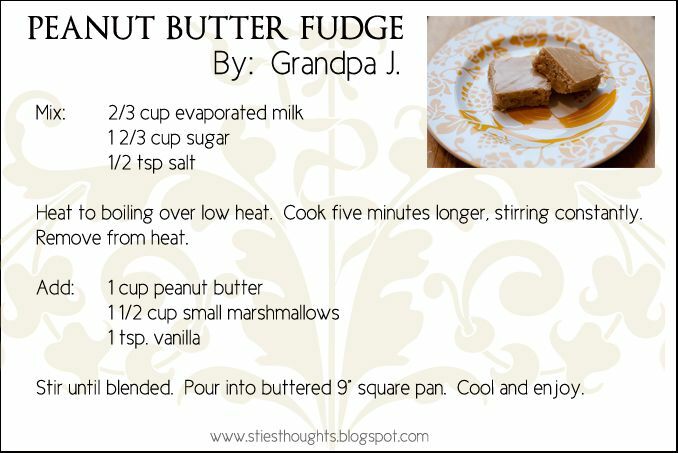 This time of year, I think of him fondly when I make his peanut butter fudge. I have no idea of the recipe's true origin, but when I taste it, I am transported back to a warm kitchen in a small, modest home. A bowl of nuts sit on the table next to the large toaster oven. The shiny, textured wallpaper smiles down on my freckled cheeks, pink from climbing a tree in the front yard. A gruff voice yells as kids run in and out, though he shakes his head in laughter when they can't see. 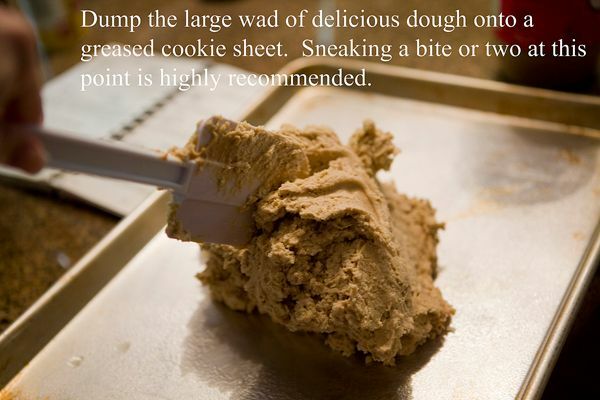 Ice cream is always in the basement freezer, and cookies are always in the bread box. It's a place that is woven into the fabric of who I am. It's a home where hours of my childhood were spent happily climbing trees, playing the dusty organ in the basement, and hiding in the metal wardrobe. A place where cousins were always laughing and the love and soul of family was so thick you could taste it. I love you, Grandpa. Miss you terribly, even after all these years. This batch is for you. You're welcome. Think of him when you make it, will you? 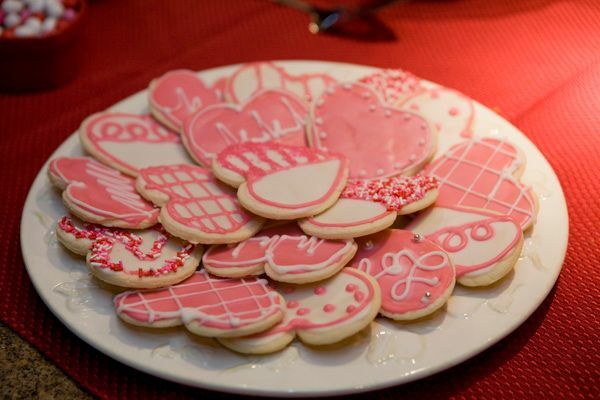 Want to learn how to make these? All right, all right. I'll help you people out. Because I love you. And because it is my life's work to fatten the rest of you up so that maybe eventually I'll look thin. Okay. Got that out of my system. 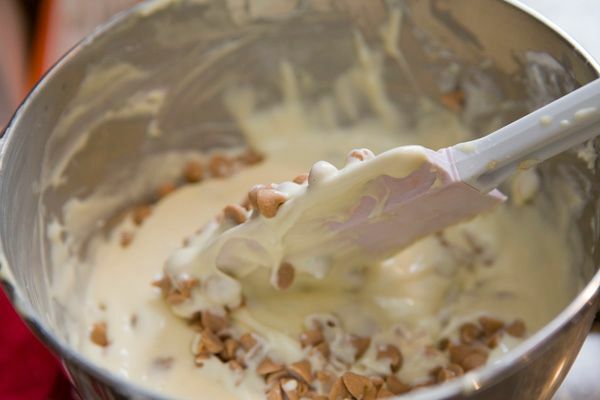 Let's make a cheesecake. 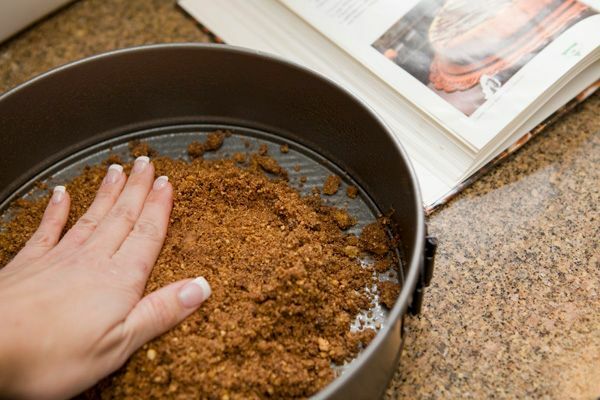 Combine and press into the bottom of a greased springform pan. Set aside. 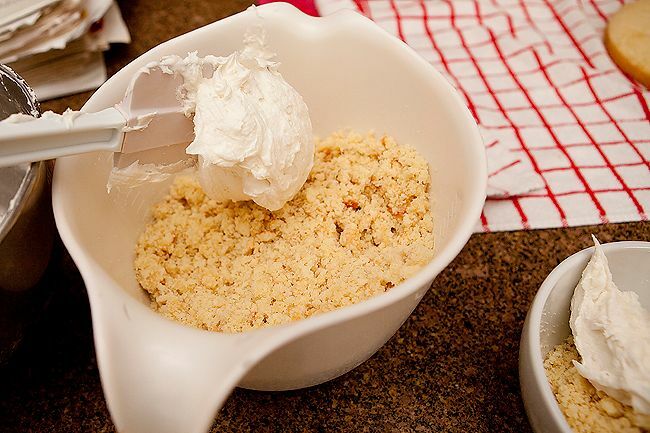 Take 3 packages of softened cream cheese (the 8 ounce size) and combine with 1 1/2 cups sugar. 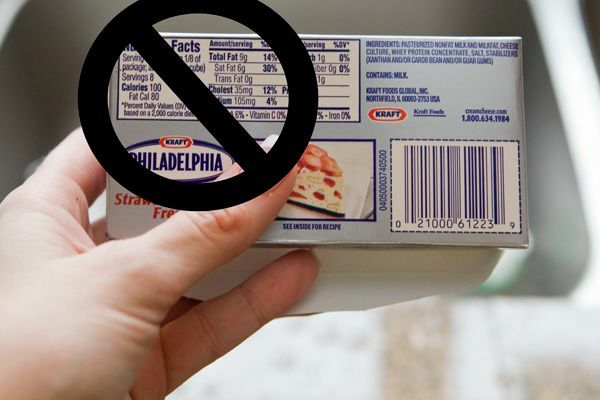 Do not, under any circumstances, notice how many calories are in the cream cheese or make mental calculations as to the calorie content of this dessert. 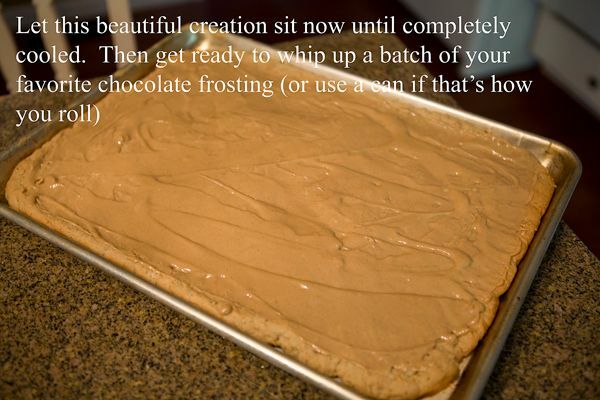 It will cause depression and self-loathing, which require the making and eating of MORE cheesecake. Which will in turn cause more depression and self-loathing. Let's just avoid that vicious cycle all together, shall we? 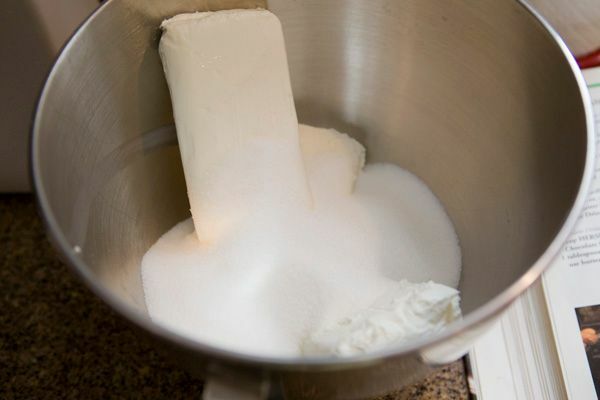 Beat sugar and cream cheese well. Add 4 eggs and 2 tsp vanilla. Beat just until combined. 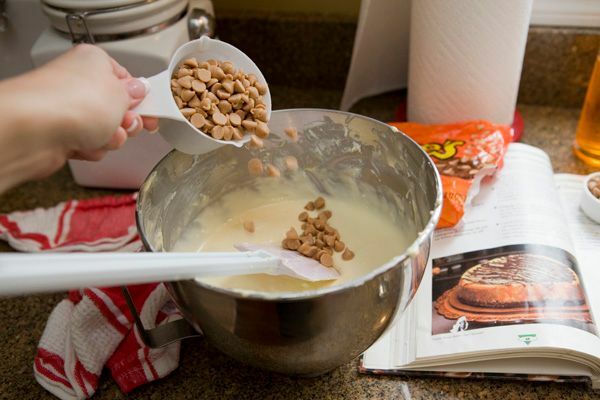 Add 1 2/3 cup Reese's peanut butter chips. This is the small 10-ounce bag found in the baking aisle of your grocery store. Or measured out of the extra large billion-ounce bag they sell at Sam's Club. 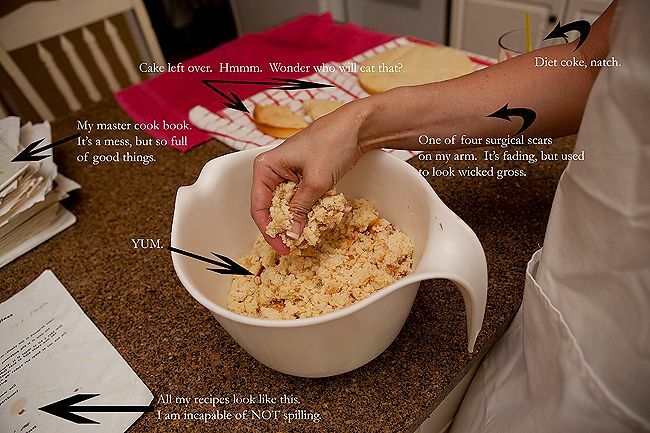 You know, the one you can grab handfulls from anytime you happen to be in the kitchen? Yes. Get that one. 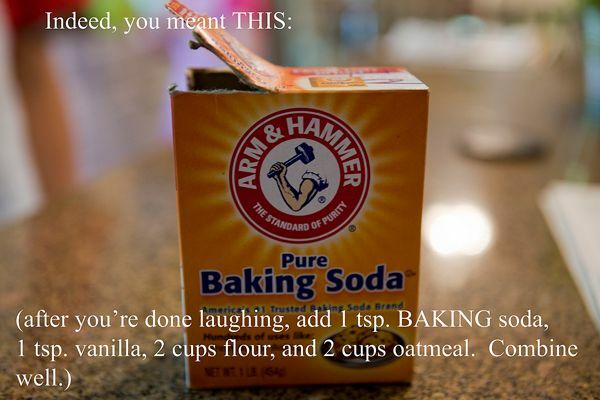 My bum will thank you. 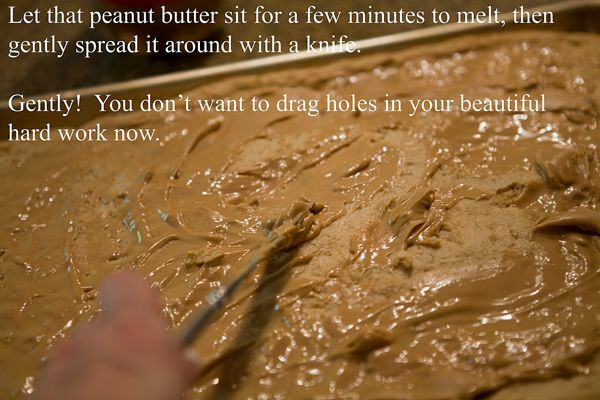 Fold in peanut butter chips gently. Pour over prepared crust and pop into a 350 degree oven for 50 to 55 minutes. Bake until slightly puffed and center is set except for a 4-inch circle in the center. 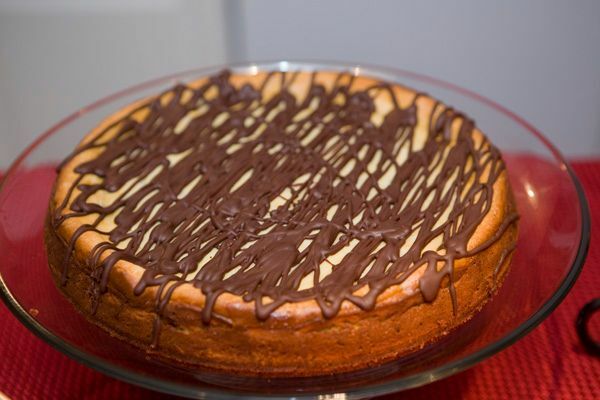 I have found that with my oven, I end up cooking the cheesecake probably 60 to 63 minutes total. 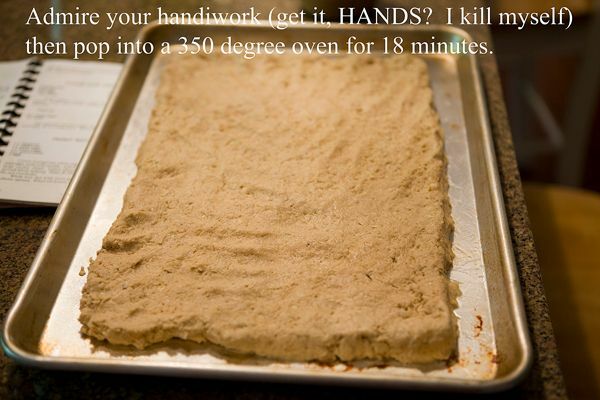 Remove from oven and cool for 30 minutes. 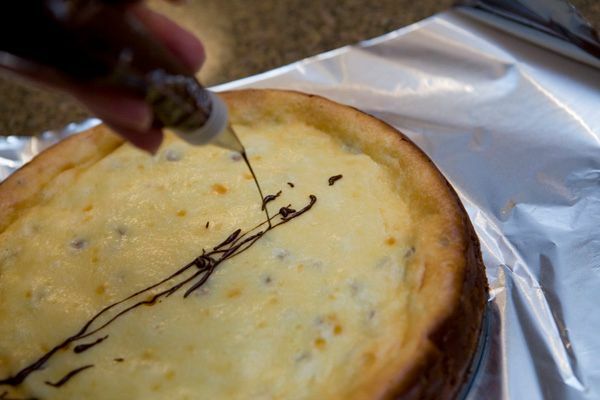 With a knife, loosen cheesecake from the side of the pan. Cool completely. 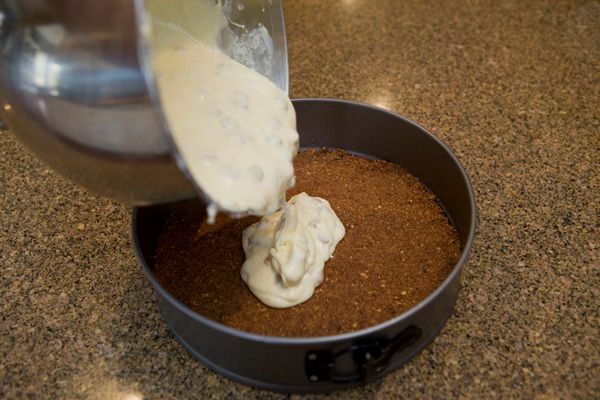 When completely cool, remove side of pan, and get ready to make the chocolate drizzle. 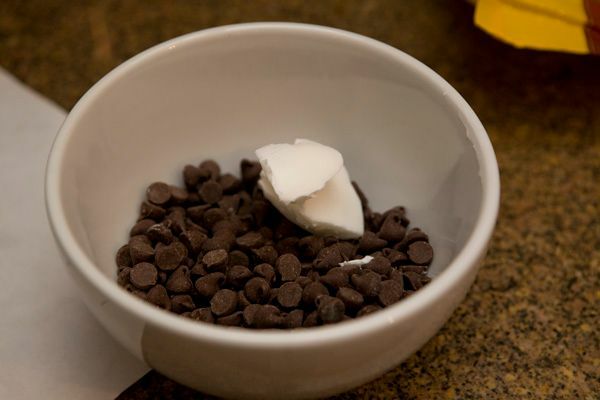 For the chocolate drizzle: Melt 3/4 cup semi-sweet chocolate chips and 1 Tbsp shortening in microwave on high for 30 to 45 seconds or until smooth when stirred. I like to fill a pastry bag with the melted chocolate because I'm uber fancy, but you can easily drizzle it from a spoon if that's how you roll. 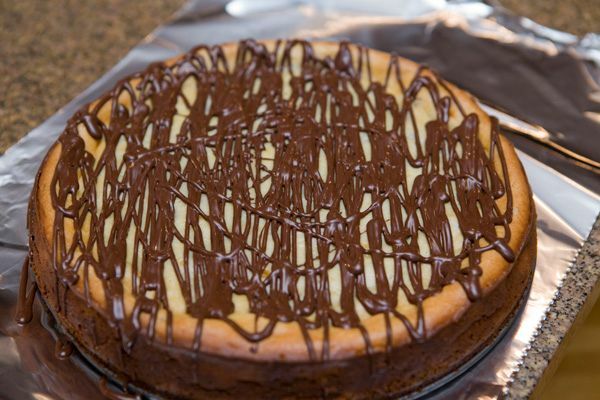 Drizzle chocolate until you're satisfied or it's completely covered- whichever comes first. 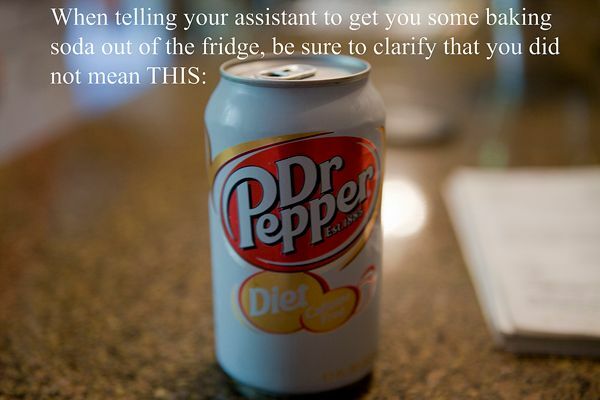 Pop into the fridge to set for several hours. 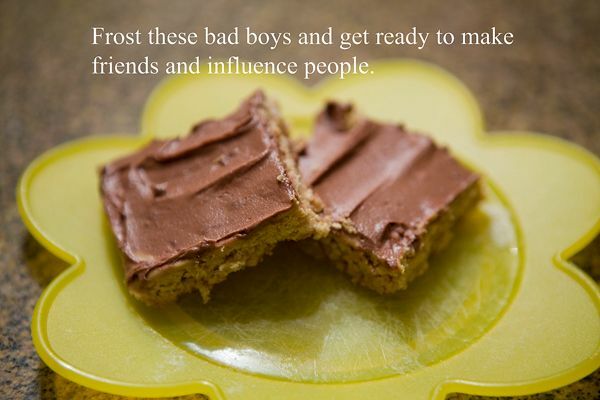 Invite people over to partake and find that you have won friends and influenced people. Recently, our church has been working on forming an emergency preparedness plan that would provide help and strategies for our congregation in the event of a major disaster. They've divided us into groups based on our geographic proximity to one another, and the Husband is our team captain. I feel confident in saying we will be the most prepared group of them all. Honestly though, either one works for me.